The San Diego Zoo is one of the city's biggest attractions and has a worldwide reputation for its enlightened management program, worldwide conservation efforts, natural animal environments and most notably its success in breeding endangered species in captivity for reintegration into their natural habitats (together with the Wild Animal Park north of the city). It is the only zoo to have successfully bred Chinese giant pandas in captivity. The zoo houses more than 4,000 mammals, birds and reptiles. Many rare and endangered animals roam simulated natural habitats, while tourists follow walkways and bridges, passing waterfalls, tropical forests, sandy plateaus, arctic tundra, and bird aviaries. The 100-acre (40-hectare) park can be explored on foot, on narrated open-air trams, hop-on-and-off buses, or above the ground on the aerial Skyfari tram or hot air balloon. One of the highlights is the Tiger River Asian rainforest with animal enclosures situated along misty trails enhanced by waterfalls and exotic plants. It features tigers, pythons, tapirs and crocodiles. Other highlights include the Gorilla Tropics, Sun Bear Forest, polar bears in a simulated freezer, and the Ituri Forest Exhibit that features African buffaloes, monkeys and hippos. There is also a Children's Zoo where small animals such as rabbits, goats and sheep can be petted, and the nursery where the latest arrivals are looked after. An outdoor amphitheatre has daily sea lion and other animal shows. Some 35 miles (56km) away is the San Diego Safari Park, where visitors can see animals like giraffe, rhino, cheetah, elephant, tiger and gorilla in open-air habitats. Tours are available by tram, bus, Segway and even zipline. Opening times: Open daily 9am-5pm, and 9am-6pm during Spring Break (March). Admission: Basic admission is $54 (adults), $44 (children age 3-11). 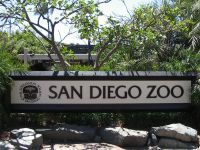 Combination packages with the associated Wild Animal Park and the museums of Balboa Park are also available.